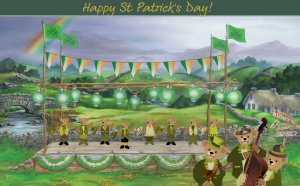 You are at:Home»HOLIDAY/SPECIAL DAY»HOLIDAY: HAPPY ST. PATTY’S DAY! No one in L.A. ever wants to do anything for this holiday! But I always have a great time when I’m on the east coast on any March 17. Last year, my friend Sheila came from Ohio to hang with me in New York, and we spent the evening with my Brooklyn pals, Jeff and Anna. All four of us had a perfect time, with fabulous dinner, club-and-bar-hopping, and dancing the night away while photog Anna took pro pictures of it all. More than that, one cannot ask. And a few years ago, my Little Rhody friend, Amanda, and I took a train from Rhode Island to Boston to have afternoon tea at a classy hotel with Lucia (who’s from LA, like I am,) and Tattie, from New York. How perfect was that?! This is from one of the fabulous cards at www.jacquielawson.com, which I highly recommend joining! You don’t need tickets to the show to enjoy the pre-and-post activities. There’ll be bands, dancers, food trucks, a beer garden. (I hope those suds will be green!!!) And the pièce de résistance will be Janis’ own psychedelically painted 1965 Porsche 356C Cabriolet, which will be on display! Can’t wait to see that one! (It’s actually a very big deal; I read that, since 1995, it’s been on loan from her siblings to the Rock and Roll Hall of Fame Museum in Cleveland.) But it’s giving me a fashion challenge for today—plain green or tie-dye green? Speaking of green, a little heads-up if you go anywhere today: if you’re not wearing green, prepare to be pinched! I know that I’ll be taking advantage of that rule! I’ve given you fair warning. SPECIAL DAY: MY 1,000TH COLUMN!!! Karen, I had a great time at your tea party at your mom’s house. You decorated the dining room so beautifully! I think I have pictures. If I remember correctly, my sister Patti was there, also. And the only times I went to the parade was with you! Happy St. Patrick’s Day! Don’t worry, I’ll be wearing green today.